Fall is here y'all! The pleasant aromas of apples, sweet potato and pumpkin pies, toasted marshmallows, and cinnamon and nutmeg spices, all serve as gentle reminders that winter is right around the corner. I'm not quite sure why, but every year the brisk cool air feels brand new to me. Something that warms the inside while blending hints of the harvest season is definitely in order. 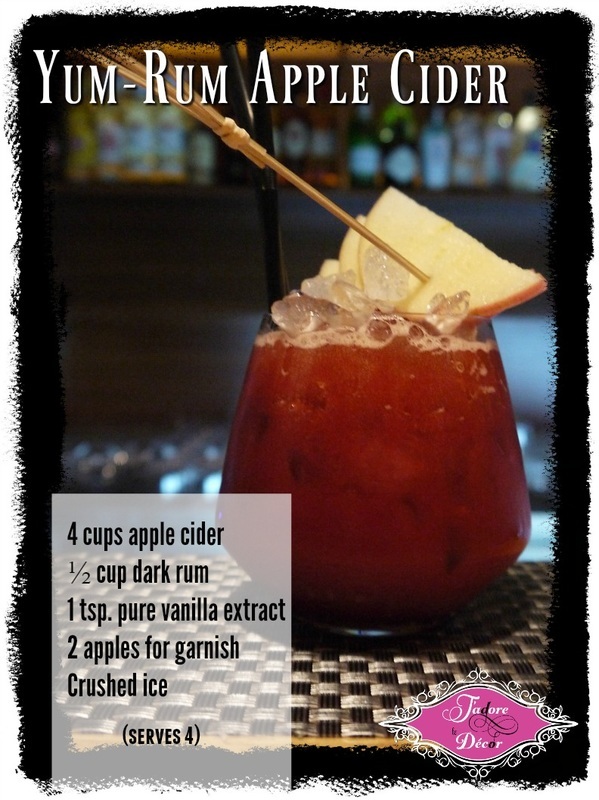 If you agree, then you'll love this week's Friday Fix: Yum-Rum Apple Cider. For the non-alcohol version, eliminate the rum, and replace the apple cider with sparkling apple cider, then add a 1/4 cup of grenadine, and a squeeze of lemon. This drink is best shared with friends. So savor the flavor and enjoy your good company. Monday will be here before you know it. Tell me, how do you reward yourself at the end of the week? What's your Friday Fix?